The National Library of Medicine hosted an awards ceremony recognizing the people who contributed to the success of the 2011 National Institutes of Health Combined Federal Campaign (CFC). And what a success it was. The NIH community contributed more than $2.6 million for local, national and international charities. NIH achieved 111.6 percent of its overall goal; nearly half of all NIH workers contributed to the 2011 CFC. The ceremony, held February 29, honored all of the NIH CFC leaders and volunteers as well as recognized the NIH Institutes and Centers that raised the most money. Dr. Donald A.B. Lindberg, NLM Director and 2011 CFC vice chair and Dr. Lawrence Tabak, NIH principal deputy director presented the awards. James Francavilla, deputy director for the CFC National Capital Area (CFCNCA), spoke about the success of previous campaigns and was thrilled with the results from 2011. About 30 employees from the NLM and the R&W formed the CFC steering committee. They organized activities such as the Kickoff event; the Neuroscience and Rockledge key worker luncheons; and the “Picture of Giving” photo contest, in which each NIH IC submitted a photograph that represented charity and giving. 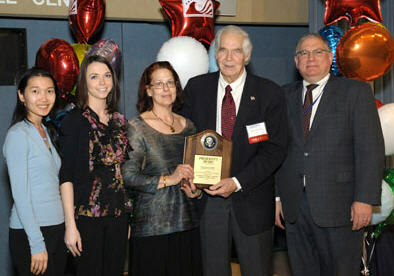 NLM had 75 percent employee participation and was recognized at the NIH ceremony with the President’s Award. A week later, at the 2011 Finale and Awards Program orchestrated by the CFCNCA, NLM was awarded Best Photography and Use of Images; Best Campaign Writing or Publication; and the Most Innovative Campaign Technique. A recap of the 2011 NIH CFC and pictures can be viewed at the campaign website. Photo Caption: NLM CFC deputy coordinators (L to R) Hue Banh, Alise Freund and Janie Robak accepting the President’s Award from Dr. Lindberg and Dr. Tabak.